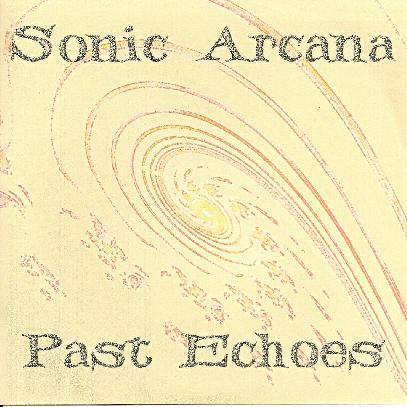 Sonic Arcana - "Past Echoes"
Wow, this is some of the best space-music I've heard in a long time... and live, too!... as front-man Kev Ellis refers to it: "a live ambient set" (as distinguished from his other projects BubbleDubble and Trev & Kev). Here Kev plays the Kaossilator, Kaoss Pad and offers the occasional vocal, Andy Radburn the second synth and programming, Marcel Hone (Tribe of Cro) the bass and Mitz the sax. Snow Glide introduces the dreamy electronic dub leanings of the group... and a truly spacious sound it is. African Sunrise is a beautiful ambient-space tune with programmed percussion... super-sumptuous stuff, so many layers of keys and various flourishes... though Kev doesn't let you forget they're in a club as during the intro he accepts a pint from a mate. One (very minor) annoyance about this CD is the little "pop!" glitch that goes off with each track break, maybe that will be edited out if there's a proper label release of the album. The longest (and most rocked-out) track on offer is the pure British tribal music of Alpha Crucids - driving tom-toms, sax bleats and all synths aflare: seeming to multiply themselves exponentially... a mind-blowing space-fest!... the spirit of Hawkwind is very strong here, as much so as on the next cut, the gorgeously melodious Ethereal Floaty, the vocal of which references the Hawks' Stonehenge Decoded. Syrinx is another stellar chill-out piece... bird-song, bleeps, whooshes, soft luscious waves of floating serenity. Enter the Fire is divided into three parts, a driving techno for the first, melting into flutey tronics for the second, and becoming spaced staccato keyboard sequences with Kev moans for the third. Kev plays the MC as the band launch into closer Nerves Made of Steel, which is indeed a disguised cover of Bob Calvert's Right Stuff... possibly something akin to live drums on this one... all in all, an excellent set! Kudos.